Jessica, the shop owner, is not only creative and the production line behind the products, but she is also amazingly generous with her hop winnings! WELL...if you just happened upon my blog (very amazing considering that there are a GA-ZILLION blogs) and why you ended up here is truly a miracle, you might want to start AT THE BEGINNING. If you are hopping along, aren't you amazed at all the great stuff you have seen so far? I was. The other design team gals have some great ideas to share! And you need to continue on your journey, right....so get moving! Kimberly is next up and I am sure she has a great new idea to share! I love that little snowman.. what a great card.. I love your sparkly embossed snowflakes and that skinny legged snowman. High of 25 predicted here for tomorrow. You'll like where you are much better. Love your snowman button! I am not a snow person either but I sure do think your card is adorable! Love the snowman button! Love this card!!! that snowman is adorable. I am with you, I don't like the cold, I much better love to be here where it is warm all of the time. Such a gorgeous card. I like Pinque Peacock button you use. And how cute is your snowman and snowflakes. Love your card with the bling and cute snowman!!! 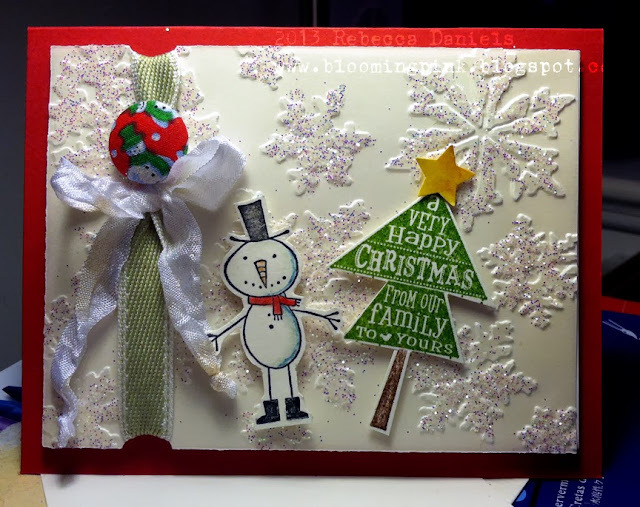 Awesome card - love the ribbon, the sparkly embossed background and the adorable tree and snowman. Rebecca, your posts always captivate me. You are an excellent writer on top of your artistic talent! Love your skinny legged snowman! Hugs!!! a cutie card... and the snowman is toooo cute!! love the snowflakes on the background.... and that button is so awesome!! This is adorable Rebecca! Iowa winters are no fun so I do not like to see the snow (it is supposed to snow today!). so adorable. I love the little tree. Great job. love this beauty, rebecca! so happy to see your blog back in action, been missing your creative posts! this card is marvy…those snowflakes are too pretty along side that fun and skinny leg snowman! thanks for sharing with us….big hugs my crafty friend! I love your little card! As I type this it's snowing here! If it was sticking and wasn't so cold and late I would go outside and play! LOL! I love the snowman and the embossed snowflakes! SUch a fun and fabulous card, love all of the details from the embossing to the pinque peacock christmas button! What a fun and darling card, awesome job on it!